The volleyball tournament takes place in Moscow near the Kantemirovskaya metro station. A player tapes up his finger tips before the start of his match. Some players say the weekly tournament helps them get leads on new job opportunities. 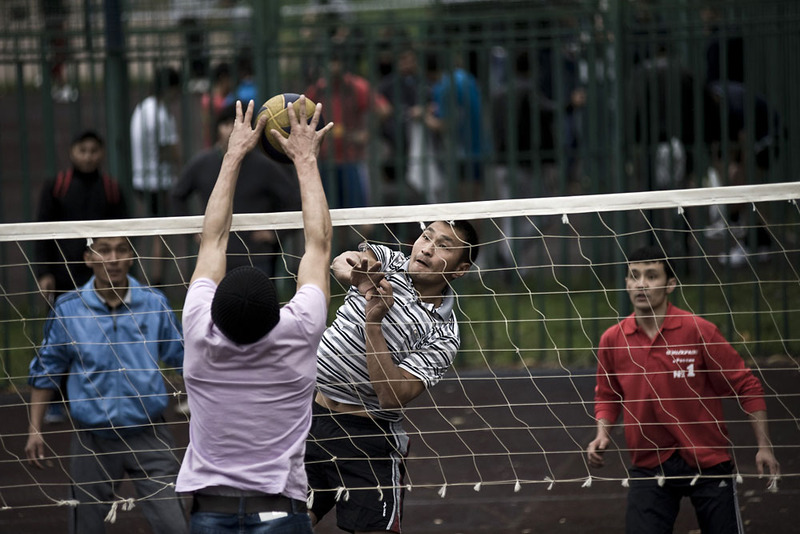 The volleyball tournament features teams mostly of Kyrgyz migrant workers. The tournament takes place on a public basketball court. The chance to play volleyball is a high-point in the week for many, providing a way to reconnect and release stress. Spectators watch the day-long tournament. Uzbeks, Tajiks, and Russians also used to join in the tournament, but this year it has only been Kyrgyz. “You can converse, meet people, find out news from home,” one player said. The winning team on a typical Sunday walks away with about 8,000 rubles (close to $250) or more. Lots are drawn to determine the first round of opponents. During an Aug. 3 tournament the winning prize will include a used car. Players and spectators pray at the end of the tournament. The team from the town of Jalalabad in western Kyrgyzstan. Some teams wear matching shirts. After the final the winning team is rewarded with a congratulations and prize money. Players leave the court as the net is rolled up for a new tournament next week. A group prayer finishes the day. Every Sunday a group of Central Asian men gather to play volleyball in a school stadium located not far from the Kantemirovskaya metro station in Moscow. For participants, the weekly competition offers a welcome respite from the usual rigors faced by labor migrants in the Russian capital. Most of the players these days come from Kyrgyzstan. But in previous years, according to Syrgak, a native of the Osh Region who has been working in Russia for nine years, Uzbeks, Tajiks and Russians used to show up. “We haven’t seen the others for a long time. This year it’s only us,” he said. During most of their time in Moscow, these men have to endure long hours on the job -- mainly in the construction sector -- often working under difficult, even dangerous conditions. They have to deal with discrimination and regular shake-downs from law enforcement officers. The chance to play volleyball is a high-point in the week for many, providing a way to reconnect and release stress. “You can converse, meet people, find out news from home,” Syrgak said. “If we didn’t have volleyball, we’d never see each other,” said Miradil, a native of Nookat who has been in Russia for two years. While the social aspect is important, many enjoy the competition. Especially in southern Kyrgyzstan, volleyball is popular. Teams tend to be organized on a geographic basis, comprising players from the same regions or towns back in Kyrgyzstan. Some players find time to practice during the week in an effort to gain an edge on Sundays. The desire to hone their games is understandable, given that the teams compete for prize money. To enter a Sunday tournament, each team kicks in about 2,000 rubles (about $62). The winning team on a typical Sunday walks away with about 8000 rubles (close to $250) or more. On special occasions, the prize for the winning team might even be a second-hand car. Umurbek, a labor migrant from Osh, noted that a tournament featuring teams from various regions is scheduled for August 3. A car will be up for grabs then. “It’ll work like this: someone [on the winning team] will buy out the rest and give each of his teammates a proper share in money. It’s easier, of course, to have the top prize be money, but a car is more interesting,” he said. Konstantin Salomatin is a freelance photojournalist based in Moscow.